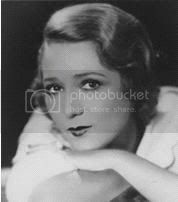 Gladys Smith, born in Toronto, Canada, on the 8th of April 1893, may not have looked so good in lights as the chosen name of Mary Pickford. Her father died when she was four-years-old and she went into summer stock, saving the family from poverty. Moving to New York, she went onto Broadway, and from there arrived in Hollywood in 1909. She later earned the title, thanks to studio advertising, America's Sweetheart. Her small frame and childlike beauty made it difficult for her to break into the more serious roles of romantic leads. She was a founder member of United Artists with Douglas Fairbanks, who she married that same year. Sixteen years later they were divorced but Mary kept their beloved family home of Pickfair, later marrying Charles Rogers. She made her last film in 1948, preferring Broadway, though there were many attempts to entice her back into films. She was said to haunt her former home of Pickfair, where she spent the last years of her life a recluse. 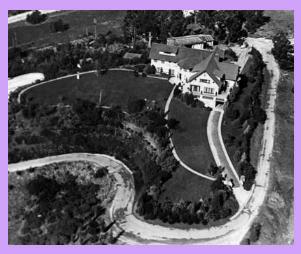 Seen wearing a white ruffled dress in the den, the house is no more but Mary Pickford could still well be there. She and her husband at the time, Douglas Fairbanks, claimed they had seen the ghost of a woman walking up the stairs of Pickfair carrying sheet music. Mary Pickford's Grave. For some strange reason, her grave, like many others at this cemetery, is private, and eager fans can be arrested for trespassing. This seems a shame as her memorial is a fitting work of art which should be there for anyone to admire. But you can judge that for yourself.